Late in the summer of 2005 following the devastation of Hurricane Katrina, a Vicksburg resident and noted photographer, Melody Golding, visited the Mississippi Gulf Coast as a Red Cross volunteer. Carrying supplies and a camera, Golding began keeping a photographic journal of the days after the storm. Golding felt that her images, representing a year-long chronicle of the aftermath, needed to be shared with the world beyond the coast. Katrina: Mississippi Women Remember provides uncommonly personal insights into the life on the Mississippi Gulf Coast following Hurricane Katrina. 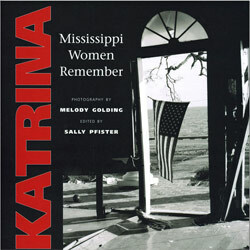 This book combines Golding's striking black-and-white photographs with more than 50 firsthand accounts of Mississippi women, and survivors of the storm. Despite desperate circumstances but with great generosity of spirit, these witnesses to one of the greatest natural disasters in North American history recorded their experiences with a broad diversity of voices. Featured contributors include Ellen Gilchrist, whose residence in Ocean Springs suffered damage, and Mary Anderson Pickard, whose home Katrina destroyed. These thoughtful and touching accounts join with the photographs in telling a remarkable story of courage and endurance. Together they paint a mesmerizing picture of this unforgettable chapter in Mississippi history. Royalties from book sales will aid artists on the Mississippi Gulf Coast. Melody Golding's photographs of the Mississippi Gulf Coast after Katrina have been shown in solo exhibitions at the National Museum of Women in the Arts in Washington, D.C., as Katrina: Mississippi Women Remember, at the Walter Anderson Museum of Art in Ocean Springs, Mississippi, as Stark Exposures: Images of Katrina, and now as a national traveling exhibition sponsored in part by the Mississippi Humanities Council Her work is featured in numerous public and private collections and some of her Katrina photographs were included in the Royal Photographic Society Awards Journal in England.